This past week, there was the start of a solid upward move above $0.0700 in cardano price against the US Dollar. The ADA/USD pair broke the $0.0724 resistance area to move into a strong uptrend. Buyers gained traction above the $0.0800 resistance and the 55 simple moving average (4-hours). The price even broke the $0.0900 and $0.0920 resistance levels. Finally, there was a break above the $0.1000 level and a new monthly high was formed at $0.1018. Later, the price started a downside correction below the $0.0950 level and the 50% Fibonacci retracement level of the recent wave from the $0.0693 low to $0.1018 high. The price also declined below the $0.0900 level and the 55 simple moving average (4-hours). However, the $0.0820 level acted as a solid support. Besides, the 61.8% Fibonacci retracement level of the recent wave from the $0.0693 low to $0.1018 high also acted as a support. The price is currently rebounding and trading near the $0.0860 level. More importantly, there is a crucial contracting triangle in place with resistance at $0.0870 on the 4-hours chart. If there is an upside break above the $0.0870 and $0.0900 resistance, the price could continue higher. In the mentioned case, the price may revisit the $0.1000 resistance area. On the other hand, a downside break below $0.0840 and $0.0820 might increase selling pressure. The next key support is at $0.0724. 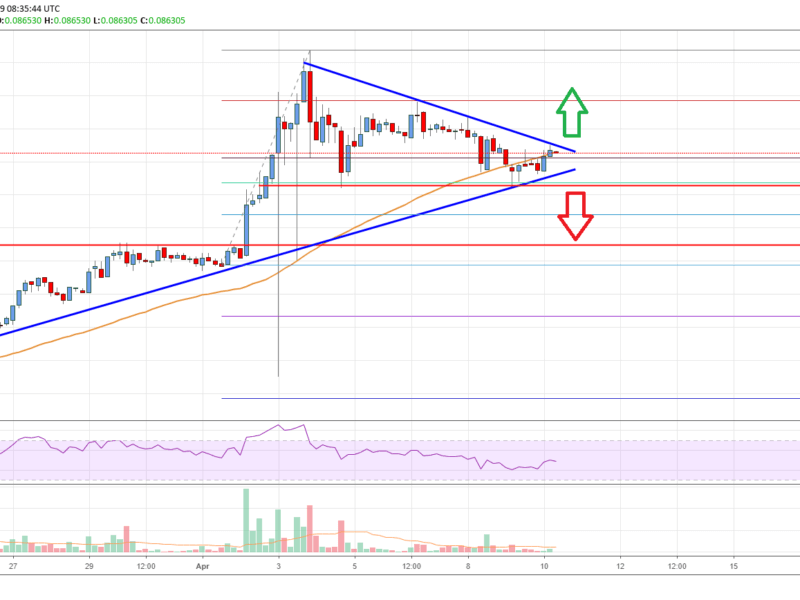 The chart indicates that ADA price is likely setting up for the next major upside break above the $0.0870 and $0.0900 resistance levels. It may test the $0.1000 level or bulls might even push the price towards the $0.1050 level. Conversely, if bears step in and push the price below the $0.0820 support, ADA could dive into a bearish zone in the short term. 4 hours MACD – The MACD for ADA/USD is slowly gaining momentum in the bullish zone. 4 hours RSI – The RSI for ADA/USD is currently just below the 50 level and it might move further higher. Key Resistance Levels – $0.0870 and $0.0900.